So Ada was pregnant. We did an ultrasound and thought we had 3 pups. Later we did a x-ray and counted 5 puppies. The day they were born started at 5:30 am. At that early moment, Roza came to us. 5 hours later and still no more pups, we loaded Ada up and went into the hospital. Upon x-ray, not 4, but 5 more pups awaited us. The last to be born, nearly 9 hours later. The Blue Boy was born, the Bonus Puppy. Now, we had all intentions to keep another female. In the end, we picked Blue Boy, now our Eddie. The 2009 hunting season began and we even snuck in a few more show weekends. UKC CH in front of his name and a few birds in the bag to boot! 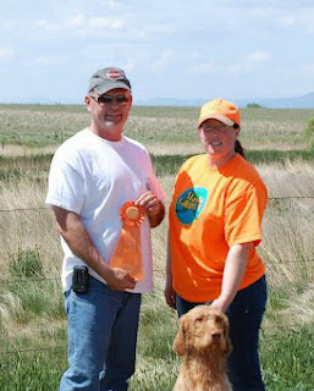 Eddie tested in NAVHDA NA with 5 of his litter mates here in CO. He walked away with a P2, not bad at all! July 2010 Eddie earned a new nick-name: Hose Nose. He had to be sedated have a plastic catheter fed into his naso-lacrimal duct on his left eye and then wait 5 weeks. In the end the grass seed (or what ever was in there) came out on its own, about 3 days before we sedated him to remove his catheter. Hose Nose!